Bible Word Search Free is a traditional word search game made up from over 10000+ Bible inspired words. Bible Word search puzzles are a great activity for Sunday school, Bible camp, home school and Christians. Every puzzle is 100% free to play and know the definitions of the Bible words. The Bible Word Searches are organized by skill level - Easy, Medium, and Difficulty. - Hints to use when stuck. - Words may be placed horizontally, vertically, or diagonally; left to right or right to left. - It is Good for Sunday school, or personal enjoyment. • Words can be horizontally, vertically, or diagonally; left to right or right to left. • Simply swipe your finger over a word to select it. • If you've found a valid word it will remain highlighted and marked on the word list as found. • Find all the words in the list to complete the level. • Faster you find words higher the score & ranking. 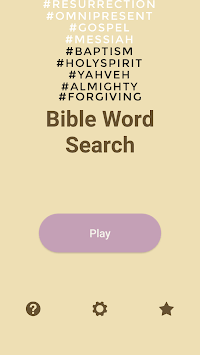 The best and most accurate way to find the biblical definition for a particular word is by playing Bible Word Search Puzzle. 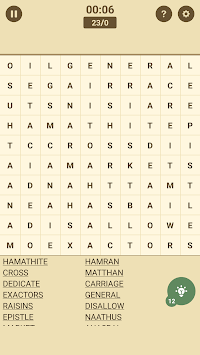 Click any Word from the list given in game to know the meaning of the Word. When you look up a word in a game, use it as an opportunity to learn about the whole range of meaning of a word throughout the Bible. 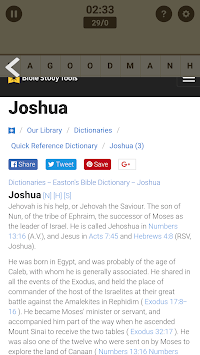 This App helps us know what a specific word means in a specific context in the Bible. Sometimes words are defined directly, but other times a word may be defined by comparison or contrast with some other word. Search collection of popular Bible Words for the meaning of words found in the Bible. It gives definitions for Biblical words to define and analyze Scripture. If you are struggling to find the particular word in a game, look up the Hints to use when stuck. Just click on "Hint" icon then you will get Hint Word easily. To get started playing, just click a Play Now button. Best of luck.